Constance L. Frazier, a Rockland resident with an extensive resume as an educator and longtime member of the Nyack NAACP, will be announced as Rockland County’s new commissioner of Human Rights today, Thursday, July 13 at 11 a.m. A press conference will be held by County Executive Ed Day in the County Office Building. Frazier has served as assistant superintendent for Curriculum and Testing at Orange Public Schools in Orange, NJ from 2003 until the present. She has been an associate superintendent for other schools in New Jersey, as well. 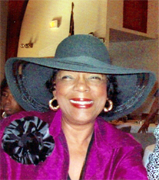 She has been honored numerous times as a leader in the African-American community. In applying for the job, she provided a two-page summary of her experience and outlook on human rights issues. The prior commissioner appointed by Day, Penny Jennings, only served a short time before being forced out by Democratic legislators for reasons unclear. Jennings currently works for the county’s Community Development program. The former 14-year incumbent commissioner Ram Nagubundi was placed on administrative leave by Day in 2014. Nagubundi sued the county and settled the case in 2016.